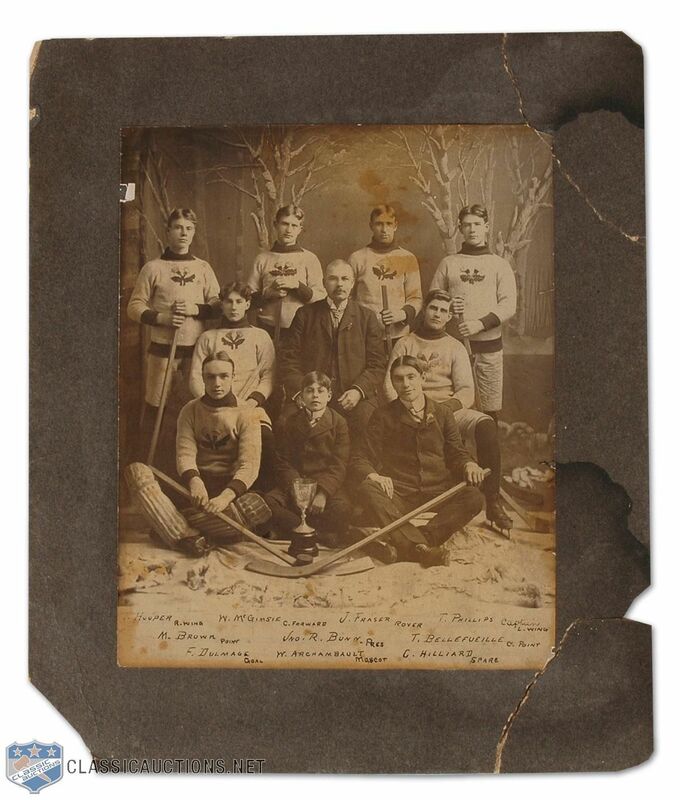 The glorious hockey past of the little town of Rat Portage, Ontario, which changed its name to Kenora, comes forth at the sight of this captivating cabinet photo. The Thistles challenged for the Stanley Cup on three separate occasions and finally captured Lord Stanley’s coveted trophy in January of 1907 after traveling to Montreal and defeating the Wanderers 4-2 and 8-6. Three Hall of Fame members of that championship squad are pictured in this studio shot, clicked a number of undetermined years earlier. Tommy Hooper is standing at the far left and beside Billy McGimsie, while captain Tom Phillips is standing at the far right. Also standing is J. Fraser, with Matt Brown and T. Bellefeuille seated and goaltender Fred Dulmage in the front row. The period that the three Hall-of-Famers skated for the Thistles (at the same time) spanned 1904-05 to 1906-07, although their apparent young ages here and the fact that fellow Hall-of-Famer Si Griffis is not present, lead us to believe that the photo is even earlier. The Thistles’ junior club, which defeated the town’s senior team in 1900, with the aforementioned Hall-of-Famers going on to Stanley Cup fame, is our bet. Turtleneck sweaters with Thistle crests unlike those seen in team photos from the 1905-07 era are another clue. Cardboard mat measures just under 9" by 11", with two broken off corners still present for possible restoration purposes, and another smaller corner missing. A few ages spots and toning to the image itself, but what an image(! ), a rare one truly worthy of your museum-caliber team photo collection. The beauty of the rare photos featured in this incredible collection of hockey memorabilia is not solely in the eye of the beholder, rather it’s obvious to one and all. The pages that follow are filled with incredible treasures such as original team photos of some of the earliest Stanley Cup champions that speak to the great and broad history of the game. Lovingly fashioned by one of the hobby’s most enthusiastic and determined collectors, the remarkable items offered here for auction include some lots that are subject to a silent reserve. We are confident that this truly historical gathering of hockey artifacts and memorabilia will spark the enthusiasm and passion that drive your desire to seek and acquire nothing short of the best. Auction closed on Tuesday, June 16, 2009.